My car has some ancient Mickey Thompson Indy Profiles on it right now. I really like the way they look, but they need to be replaced this winter. I'm on the fence as to just sticking with the bias-ply Indy Profiles, or join the 21st century and get some drag radials like the ET Streets. Would it be silly to have new-tech radials on an old-tech '58 ? 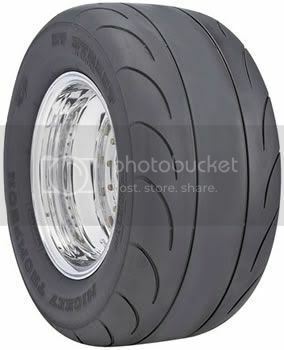 Most guys at the car shows say to "go radial". I wouldn't run a bias ply unles I was showing for a concurs judging. The handling, ride, and stopping ar almost night and day. Go with the radials they are light years safer. Greg, First up, your car is very cool looking with the big tires out back! Like others have said radials are the way to go today, you will notice the difference. I know that either in Summit racing or Jegs they have radial street/drag tires. Check them out online. Good luck, and how about some more pictures of the car, love to see that 460 monster under the hood! You know, now that you mention it, I took very few pictures of the car last summer. At least no decent ones anyways. I'll be more prepared for photo opportunities next summer. 1. New tires ($$$$. Ouch.). 2. fix or replace radiator (slow leak). 3. new rubber bushings in the rear leaf springs (cheap). 4. new weatherstripping, etc, everywhere around the side windows (they rattle something fierce. this job scares me...). 5. proper coolant catch can to replace the Miller High Life tall boy that is my current catch can. 6. Gauge panel where the junk stereo was (volts, oil psi, water temp). 7. do a better job of glueing down and fitting the carpeting. 8. Fix the emergency brake so it is operational. Greg my two (2) cents on this subject. Definitely radials for rideability and handling. I would call / text several tire manufacturers and give them the specs on what you have now?? You never know they may have just what you are looking for. Here is what wikipedia has to say about radial vs bias ply tires. '59 Tbird "The Yellow Rose Of Texas" aka "Tweety Bird"
"It's Hip To Be Square"
Hi Greg, I agree 100% on this one! take it from me I JUST SWITCHED FROM BIAS TO RADIALS AND I COULDN'T BELIEVE THE DIFFEERENCE. sorry for shouting,but I am excited over the handling and ride of the new tires,it's almost like driving my 2009. I found out last weekend that my car definitely has a Detroit Locker in the rear end. That explains that racheting noise that freaked me out when I first got the car.... It also has ladder bars, making the whole rear end pretty stout. Some shorty headers and some cylinder head porting should get me around 450 HP pretty easily. BP's are 40 yr old technology. Stage coaches would have had BP's if theyd have been around another 10 yrs.